As people struggle to get to work in the current record setting cold weather its worth considering an Australian who worked in an environment which was at the opposite end of the temperature scale. Len Beadell, (1923 to 1995), was a surveyor and engineer who created a vast network of unpaved roads in the Australian outback in the 1940’s and 1950’s. He worked in the hot, dry and savage Australian outback month after month surveying the routes for these roads. The total length of the roads he and his teams created was 6,500 km and they did this through hostile lands, some of which had never been seen by white men before. In fact most of the lands where he worked were only previously visited by explorers and Aboriginals prior to his arrival. During his surveying work Len Beadell was to be the first white man to meet some remote Aboriginal tribes and there were perhaps few better men which could be chosen for a first meeting. The purpose of these new roads was to open up and access central Australia to set up weather stations, airstrips, and tracking stations for rockets which were to be launched from the new, (at that time), British rocket testing facility at Woomera. By noon the heat in the closed cabin registered something well in excess of 127 degrees; the instrument graduations ceased at that figure, and the indicator was lying on its side in the glass bulb at the top. All thoughts of food disappeared in favour of the external longing for water, but I knew from experience that the longer a drink could be postponed, the better I would be. Then, as the labouring vehicle crawled its way over the hummocks of sand, the familiar feel of the steering wheel pulling to one side told me of my first flat tyre of the trip…………..…I reached for the jack and steel jack plate and began the operation. The jack plate was needed to stop the base of the jack sinking into the sand. The sun was unbearable and the scrub offered no shade at all, but it was almost a relief to be temporarily out of the inferno of a cabin. Although the tools were under the vehicle, they were soon too hot to handle, as the ground temperature was even worse than that inside the cabin. After one of the spare wheels was in place and the tools were put away, I had to make a big effort to lift the wheel with the flat tyre on it into the vacant rack, for it had been made hot almost to the point of burning by long, slow contact with the fiery sand. Covered in spinifex dust clinging to soaking sweat, and trying to ease the burns from the tyre, I sat on my heels in the small shade cast by the Rover, and thirst finally took over. Sipping the now almost boiling weather from a tin mug equally as hot, I thought how much some water from a water bag would be appreciated, but I knew I wouldn’t dare use one where water must be conserved. This was not getting me anywhere, so, reluctantly climbing into the red-hot cabin, I pushed on. The petrol lines alongside the sizzling engine had been left for so long that the fuel had began to boil, causing air locks in the system, and no sooner had I set off then the engine faltered, stopped, and refused to restart. The only remedy for this is to wet the lines. I had found by trial and error just where the least water would do the most good, and I sprayed water from my mouth on these parts. It seemed a most unfortunate waste of water, but without this treatment I knew only too well I would stay right where I was. Nursing a reddish burn on my chest caused by an unlucky contact with the mudguard, I tried the engine. It fired and I was on my way. Len Beadell wrote six bestselling books, which detail the construction of the roads and the hardship and adventures involved. His happy, humerous and laidback style is remarkable considering the problems he encountered along the way, and possible explains why he was so successful. I have read three of these books, and my favourite is ‘Too Long in the Bush’. The quote above is taken from this one. That particular book tells the story of the construction of his most famous road, the gun barrel highway, so called because Len tried to make it as straight as possible. This road was 1,500 km long and by linking Alice Springs to Carnegie homestead created the first road to cross Central Australia from East to West. The gun barrel highway passes to the South of the Gibson Desert and directly through the area where the man whose name gave the area its name, Gibson, went missing and died. Gibson was a member of a party of men, led by Giles, who in 1874 were the first to try and cross Australia and therefore explore this area. Len Beadell tells the story of Gibson in his book and it is worth retelling it here to show why Gibson’s Desert is so called but also to illustrate how hostile this part of Australia is. They were all camped at a base near a water rock hole at the newly named Rawlinson Range, and were waiting for rain before attempting a trip farther to the west. When no change in the weather came for a long time, Giles thought he would try anyway. Against his better judgement, he left his usual mainstay of the party, Tietkens, in the camp when Gibson persuaded Giles to allow him to go instead. They got 60 miles, left a small supply of water and dried horse meat in a mulga tree, and sent loose two pack horses to find their own way back to base along the tracks. After struggling on another 60 miles westerly, in intense heat, it became obvious, after the horse Gibson was riding collapsed from thirst, that to continue was out of the question. So they turned back, and the two desperate men helped each other by alternately riding and walking. In a bid to speed up the return, and considering himself to be possessed of the greater endurance of the two, Giles sent Gibson riding on ahead to base, to get Tietkens, to return for him. ……………The first two horses sent back to base had wandered away from their own track, which is unusual for horses, but they were probably crazed with thirst. These second tracks were the ones Gibson followed, in error. Giles realised this after finally struggling to the junction of the two, on an examination of the tracks, he knew than that help would not be coming. With the water container on his back, holding the meagre supply left after Gibson had used it, Giles now had to almost crawl the rest of the way to base if he were to survive and begin looking for Gibson. He was to do this by drawing to the utmost of his nearly spent reserves. After the day it took for him to be able to move again, he and Tietkens went in search of Gibson. 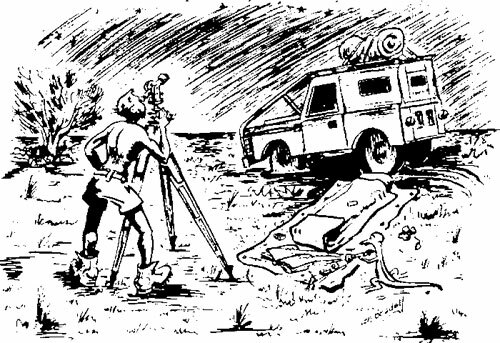 Reaching the wrong set of tracks and pursuing them, they found that he must have caught sight of a range of hills, and branched off once again towards them, thinking them to be the Rawlinson’s, but in effect he would have been travelling in almost the opposite direction away from the base. 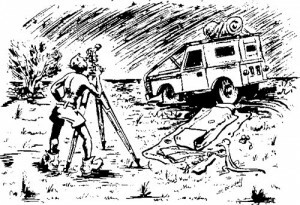 Gibson, although he had the only compass left, could not have checked with it first, and, being now in a grip of panic, terror, and thirst for certainty, had wandered to a horrible death in the sandhills. His would be rescuers followed him to a point beyond which there would surely be no returning and were forced back to base once more, hoping that a merciful death would quickly claim him, and so put him out of the agony they were themselves experiencing. It must have been with a heavy heart that Giles made the note in his diary that this desolate region west of the Rawlinson’s was now to be known as the Gibson Desert. 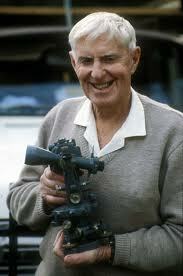 In 1987 Len Beadell became a fellow of the Institute of Engineering and mining surveyors (Aust). In the same year astronomers, in California, honoured him by naming a newly discovered asteroid planet after him. This was in recognition of the road network he created which made access to the meteorite craters they were studying possible. Len Beadell died on the 12th May 1995 and his ashes were placed at the site of the original survey peg to mark the beginning of the centre line of the Woomera rocket range, his remains have been moved since to Woomera cemetery to allow easier access for family and friends.